British Costume from Earliest Times to 1820 is a hard-to-find classic that drew on primary sources — actual costumes, illuminated manuscripts, effigies, etc. — to provide authentic detailed coverage of what people wore in Britain from the early Saxon period (ca. A.D. 460) to the reign of King George III (1820). Clothing of commoners, royalty, and ecclesiastics. Indispensable for fashion historians. Unlike many more recent costume histories, this hard-to-find classic drew on primary sources — actual costumes, illuminated manuscripts, missals, brasses, effigies, etc. — for absolute authenticity in providing a detailed, comprehensive account of what people wore in Britain from the early Saxon period (ca. 460 A.D.) through the reign of George III (1820). In British Costume from Earliest Times to 1820 the author presents detailed coverage (based on original research in the British Museum and various national collections) of tunics, cloaks, gowns, robes, mantles, dresses, and many other garments, as well as headgear, footwear, and accessories, worn during the fifth century, the early medieval period and Plantagenet reign, the time of the Tudors, the Elizabethan era, and through the early years of the house of Hanover. Over 470 illustrations chronicle the evolution of clothing styles — from the simple robes, boots, and mittens worn by the lower classes, to the sartorial splendour of royalty and the specialized clothing and accoutrements of ecclesiastics. Among a host of charming illustrations are portrayals of revellers attending a medieval dance, strolling minstrels, a royal picnic during the late 15th century, and numerous other vignettes. Long out-of-print, this superbly documented study offers the kind of meticulous research uncommon in costume histories today. British Costume from Earliest Times to 1820 is sure to be welcomed by artists, students of fashion and design, cultural historians, and anyone interested in the history of fashion will find this rare volume an invaluable resource. Emily Jessie Ashdown was a noted English scholar and lecturer on the topic of costume history. 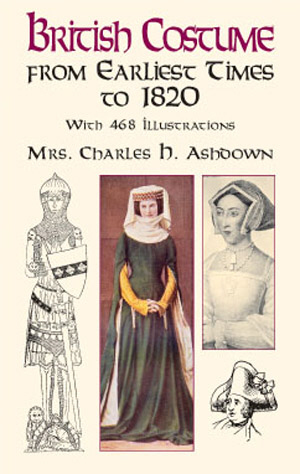 She published under her married name, Mrs. Charles H. Ashdown.